Homemade cake is the best wauy to make any occasion extra special,may be it Vanilla, Chocolate or any other flavour.Vanilla cake, rich with real vanilla is very tasty ,specially when we topped it with our favourite frosting flavour.You can try this Moist Kiwi Vanilla Cake with vanilla frosting,sure you would like it. Butter should be at room temperature.In a bowl take butter,( mixer with whisk attachment),whisk butter with low speed ,then add 2 cups sugar powder and whisk well till air incorporated. Then add more sugar powder and turn the mixer on high speed and beat frosting until fluffy and smooth. 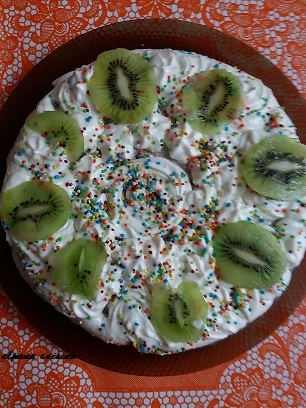 Now mixed chopped Kiwis with whipped cream and spread it on the one half of the cake and then cover with the second half piece of the cake.Now cover the sides and top of the cake with whipped cream.You can make design over the cake by piping bag with nozzle filled with whipped cream.